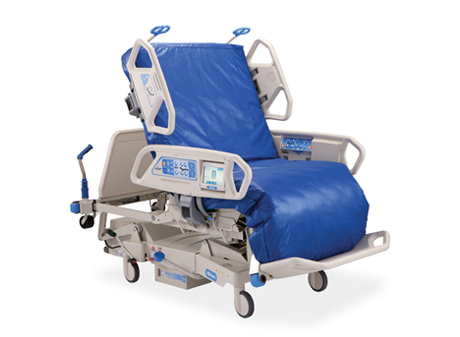 The TotalCare® P500 therapy bed delivers the versatility to also respond to the needs of the immobile patients with a moderate to high risk for pressure ulcer development. The best strategy to avoid immobility related complications is to get patients mobile as early as possible. Aside from the Progressive Mobility™ support coming with the TotalCare® bed functionality. The surface technology addresses pressure, shear, friction and heat—the four main extrinsic causes of pressure ulcers. Its weight based pressure redistribution system permanently communicates with the bed’s scale system to generate the optimum pressure redistribution settings in four different zones and in any bed position. Advanced Microclimate® Technology removes excess heat and moisture from the surface for cooler, dryer skin, helping to prevent moisture lesions and increase patient comfort. A rapid response turn assist with a reminder function helps achieving turn protocol compliance while relieving strain and discomfort for caregivers and patients. Point-Of-Care® siderail controls with Graphical Caregiver Interface feature (GCI)®.